Fasting is one of those things we would rather put out of our mind. Food is just too good these days. And who wants to suffer anyway. But if you are serious about prayer, you really should think about it. The following is an excerpt from my ebook Basics of Prayer. In the gospels there are two instances where Jesus taught fasting. The first was in Matthew 6:16-18. Here He taught fasting (along with giving and praying) as a presumed and necessary duty in the Christian life. In this passage, He did not say “if you want to fast,” or “if you feel like fasting,” He said, “when you fast.” Therefore, Jesus taught Christians to fast (along with giving and praying) as a regular discipline and duty. What Jesus taught, basically, in this passage about fasting was that when we fast, just as with giving and praying, we are not to do it as a show of good works, but rather, it is to be done from the heart, to please and honor God alone. Then, He said, when God sees us fasting in secret He will reward us openly. So we have the teaching that fasting is our duty, and that we should do it in secret. But there is another passage, in Matthew 9:14-15, where Jesus teaches us about fasting. In this passage, the question came to Jesus from John the Baptist’s disciples as to why His disciples did not fast at all, while they and the Pharisees fasted often. His reply was this: “Can the friends of the bridegroom mourn as long as the bridegroom is with them? But the days will come when the bridegroom will be taken away from them, and then they will fast.” Therefore, the teaching here (which is now for us), is that since He is our bridegroom and He has been taken away from us (as He is now in Heaven), this is now the time that we should fast. Thus we fast because we long to see His face and because we grieve over sin. It is an effort to remain pure for Him, so that He will be proud of us when He comes to take us to be His bride. But there is still one more way that Jesus has taught us to fast. It was by His example. Two of the times he fasted that we know of for sure is when He fasted for forty days without food to prepare Himself for His ministry (Matt. 4:2); and also during the time when He witnessed to the women of Samaria (Jn. 4:31-34). But He probably fasted many other times. It would do us good to follow His example. 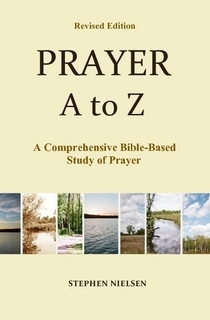 This entry was posted in Fasting and Prayer, Prayer A to Z Excerpts and tagged Basics of Prayer, Fasting, Jesus, John 4:31-34, John the Baptist, Matthew 4:2, Matthew 6:16-18, Matthew 9:14-15, prayer. Bookmark the permalink.